We Work Remotely is the biggest remote work community in the world. With over 220,000 users per month and 3,000,000 page views, WWR is an ideal space to advertise efficiently to remote workers and remote companies alike. Interested? Great! Advertising campaigns are booked as a weekly bundle package, which includes all three assets listed below. Please see calendar for availability! A weekly recap email highlighting the best products, articles and resources related remote work! 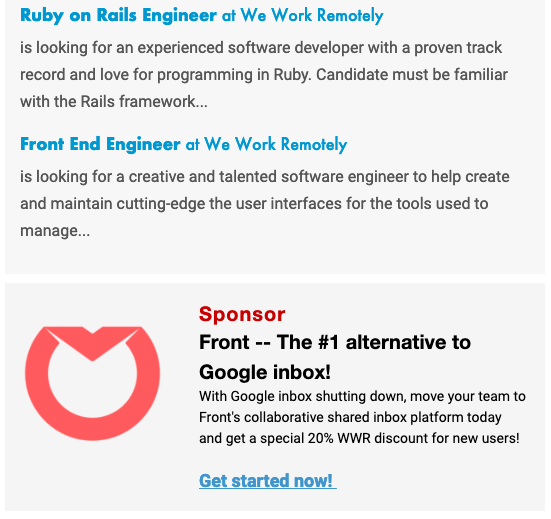 With over +47,500 subscribers, this email newsletter placement is one of the best places to advertise to the global remote work community! • +47,500 subscribers. Open rate: 23 - 24.5%. Daily emails sent to subscribers who have signed up to receive notifications when jobs in a specific category are posted. This is a great way to get regular touchpoints with remote work job seekers! • Frequency: Daily for 7 days. Weekly interview style podcast where we talk to thought leaders in the remote work space! We'd love to hear from you! Please reach out and we'd be happy to discuss anything you have in mind!